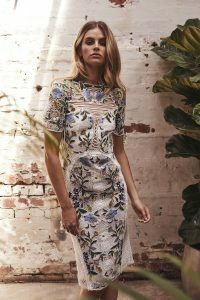 Australian label Thurley is renowned for their striking pieces, all hand crafted from the finest materials sourced from around the globe. Drawing inspiration from experiences of travel, culture and art, head designer Helen O’Connor injects Thurley with a strong sense of personality. Each season the collection features timeless pieces that are both modern and classic, specialising in eveningwear with a focus on masterfully embroidered dresses, skirts, tops, extravagant outerwear and elegant gowns.